Sergeant Jones watched the road through the darkening gloom. Somewhere out there he was sure there was a German King Tiger tank. He heard the clanking of something moving up the road and had pulled his Sherman tank into the shadows behind a broken wall. The King Tiger was a heavy tank and by most estimates outmatched his American-made Sherman. In fact, the 75mm main gun the Sherman mounted couldn't even punch a hole in the Tiger's front armor. But the Sherman was faster and more reliable. Best of all, the main gun would go through the side armor of the Tiger and at this range, parked as the tank was perpendicular to the road, Jones could hardly miss. Hitler was in love with big, technological weapons. Mighty battleships, supersonic rockets and jet aircraft were just a few of the advanced devices the Third Reich put onto the battlefield during World War II. One planned weapon that didn't make it into action, however, was the Landkreuzer P-1000 "Ratte." 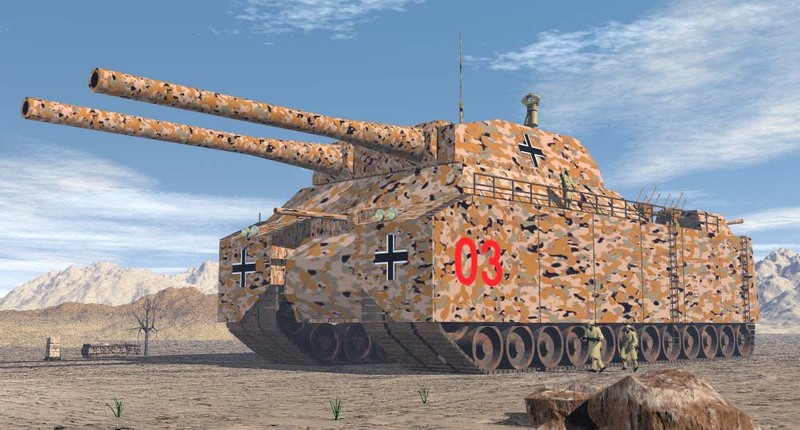 A true rolling fortress, it was far heavier and more powerful than any other tank considered by any other country before, during or after the war. If this super tank had been built, how might it have affected the conflict? 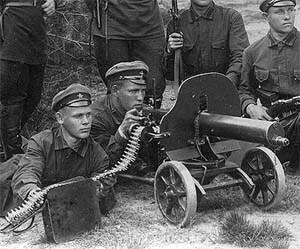 Troops man a Maxim machine gun around 1930. The story of the super tank starts with inventor Hiram Maxim in 1884. Maxim was a brilliant man and over his lifetime would hold patents ranging from light bulb filaments to car mufflers. No, Maxim did not invent the super tank, or even the tank. What he did create, however, would change war forever. He was the inventor of the Maxim machine gun. Designs for guns that could fire one round after another existed before 1884, but they were often impractical for actual battlefield use. They were usually bulky, complex affairs that had to be powered by a hand crank and were prone to jam at inconvenient times. Maxim's version, however, was simple and used the recoil energy from one shot to load the next. This made the mechanism fast and reliable. It was said that a Maxim machine gun could fire "666" rounds a minute. Estimates made at the time show that despite only achieving half of this rate under actual battlefield conditions, a Maxim was still the equivalent of 80 men equipped with standard rifles. Although some armies, notably the British, were slow to adopt the Maxim's invention, by the outbreak of World War I in 1914, machine guns could be found in the armory of every major nation. Their use quickly changed the way the war was fought. Before the machine gun, an attack consisted of thousands of soldiers charging toward the enemy line. Some were killed by the enemy rifle fire along the way, but enough survived to engage in hand-to-hand combat with the enemy in an attempt to break the line open and create a breech. An early British tank, the Mark VIII Liberty, weighed about 30 tons. After the invention of the machine gun, however, such attacks became suicide missions. Machine gun fire would mow down charging troops before they ever got close to the enemy line. During the first day of the Battle of the Somme, in 1916 the British Army tried to charge the German line and lost 58,000 men. Most of them fell to withering machine gun fire. The machine gun created a situation in which neither side could get an advantage. The troops dug trenches along their lines to protect themselves from artillery and machine gun fire and the area between those trenches became known as "No Man's Land" for nobody in his right mind dared to tread there. Military strategists realized a new weapon of war was needed to break this stalemate. The idea of a moving armored machine designed to protect troops can be traced at least as far back as Leonardo da Vinci during the 15th century who designed several tank-like devices. However, nobody actually attempted to build such a machine until Hiram's invention required it. The first country to take a serious interest in the idea was Britain. In 1915 British politician Winston Churchill established a "Landships" Committee to investigate the potential of producing such machines. The actual development was done by the British Navy since originally the devices were seen as extensions of sea-going warships. During construction the "landships" were given the designation "tanks" (as in water carriers) to keep their true nature secret. Afterward the name "tank" stuck. Film of World War I featuring early British tanks like the Mark I and Mark IV. The early British tank was the Mark I. It sported a pair of tracks that, unlike more modern tanks, ran up the front and across the top of the vehicle. It had no turret, but carried two 6-pound guns and machine guns in "sponsons" which stuck out from the sides of the vehicle. Powered by a Daimler-Knight 6 cylinder petrol engine that could push the machine forward at up to four miles per hour, it was hoped that the crews would be able to breech the enemy lines immune from machine gun fire inside the Mark I's armored shell. Though a few were employed at the end of the Battle of Somme, to the great surprise of the German troops, the first true victory for the tank came at the Battle of Cambrai in November of 1917. There some 474 tanks spearheaded an attack that captured 10,000 German prisoners, 123 artillery pieces and 281 machine guns. By the end of the war the tank was a well-established military weapon. The British had produced 2,636 tanks and the French had built 3,870. Strangely enough the Germans, who were often the first to jump on new military technological advances, had only invested in about 20. 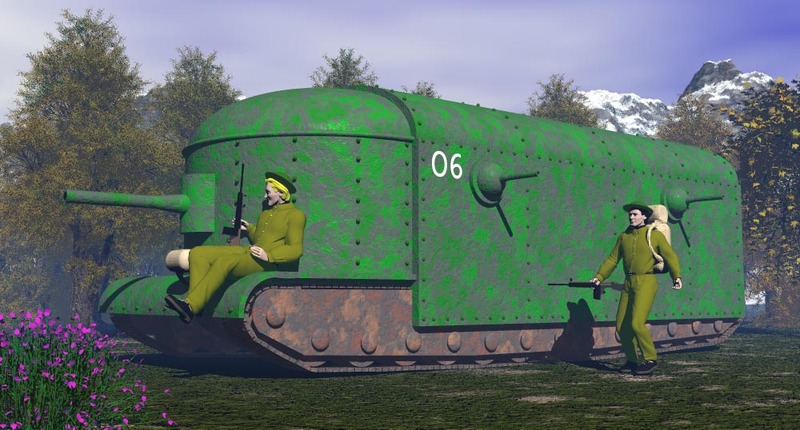 As early as 1916 British tank designer William Tritton began thinking about the first "super tank." The Mark I had been sent off to the battlefield, but Tritton was concerned that while the Mark I's 8mm thick armor was enough to protect the crew from small arms fire, it would fail if it were hit with a heavy shell. He wanted to design a tank that could withstand medium artillery fire, but wasn't sure how thick the armor would have to be. Tests of captured German guns were arranged, however, which showed such protection would require between 2 and 3 inches of metal plate. With this information, Tritton designed a super tank that was not much longer, wider or higher than the Mark I, but because of three-inch thick frontal armor and two-inch thick side armor, would have had a weight that would have been almost four times as much. Some of the original drawings for this early super tank still exist today and show a vehicle with a rounded and domed front that had a single main gun protruding from the nose of the vehicle. Various other small artillery guns and machines guns were mounted on each side looking outward. Some of the drawings also seem to suggest weapons would have been mounted facing the rear also. This super heavy tank was nicknamed the "Flying Elephant" probably because of the domed shape of the front of the machine and its main gun that looked like an elephant's trunk. The "Elephant" moniker also was probably suggestive of the huge weight (around a hundred tons) of the vehicle. The term "Flying" was clearly sarcastic as the machine would have barely been able to crawl along under the power of two 105hp Daimler engines. Top speed was estimated to be about two miles per hour. With the vehicle so underpowered there were concerns that it would never be able to work its way out of the mud should it ever get stuck. The problem that Tritton found himself facing - protection verses mobility - was one that would continue to haunt tank designers for decades. In the end, the British war office decided that faster tanks with less armor was the way to go and ordered more copies of the Mark I and its successors. Construction of the Flying Elephant was cancelled in 1916 before the first prototype was completed. The Tiger II tank.was probably the most advanced of the war, but was unreliable and too few in number to help the German war effort. While the Germans were slow to adopt tanks during the First World War, they changed their tactics soon after and invested heavily in armored and mechanized systems. By the beginning of World War II, they were able to employ a force consisting of rapidly moving mobile infantry and tanks combined with close air support to quickly break through enemy lines and bypass strong points. This philosophy of war, called Blitzkreig or "lightning war" by the Allies, allowed the Germans to quickly overwhelm Poland and France early in the conflict. The early World War II German tanks were comparable to American and British tanks in their firepower, speed and armor. As the war continued on, however, the Germans started introducing the Tiger series of tanks which carried heavier armor and more powerful guns. The Panzerkampfwagen VI Ausf�hrung, referred to by the Allies as the "Tiger I," weighed over 60 tons, almost twice that of the American M4 Sherman tank. The Tiger's frontal armor was so thick, almost 5 inches, that the Sherman's standard gun could not penetrate it. In 1943, the Germans phased out the Tiger I in favor of the Tiger II (sometimes referred to as the King or Royal Tiger) which was even heavier with thicker armor than the Tiger I. 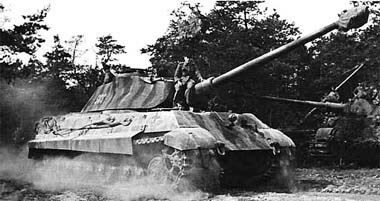 The Tiger II was perhaps the most sophisticated and powerful tank to see combat in World War II. Because of the difficulty of constructing such a complex machine and wartime shortages of raw materials, only 492 were completed by the end of the war. German plans for heavier and more powerful tanks did not stop there, however. In 1942 Adolf Hitler approved the construction of a heavier tank that would eventually be called the Panzerkampfwagen VIII Maus. The tank (as originally conceived) was to weigh 100 tons, but by the time the prototype was finished the weight had ballooned to 180 tons. It had massive armor as thick as 9.4 inches and carried a 128-millimetre (5.0 in) main cannon on its turret. The Maus was so big and heavy it was unable to cross most bridges, so a system was designed so it could cross rivers by fording them. Because of the tank's size, this was easy if the water was only a few feet deep. For deeper rivers the Maus was designed to cross submerged using a snorkel to get fresh air to the crew. Only a couple of prototypes of this massive machine had been finished by the end of the war and the Maus never saw action. 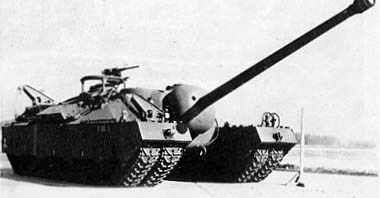 Plans for a similar super heavy tank, the E-100, were approved by Hitler in 1943, but no prototype was ever completed. 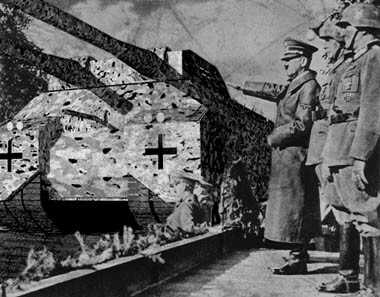 As huge a vehicle as the Maus was, Hitler had even bigger plans. Panzer Leader, Heinz Guderian wrote in his memoirs that during a conference in 1942 of senior Generals and Party Officials, "Then his [Hitler's] fantasy led him into the realm of the gigantic. The engineers Grote and Hacker were ordered to design a monster tank weighing 1,000 tons." The T-28, at 86 tons, was the largest tank destoryer the U.S. considered fielding in WWII, but it would not have been a match for Hitler's Ratte. The Landkreuzer P. 1000 Ratte, if it had been built, would have been 115 feet in length, 45 feet wide and towered 36 feet - almost four stories - into the sky. A true rolling fortress, it was to have armor 9 inches thick and be equipped with multiple heavy weapons and a crew of at least 20. The massive main turret design was to be borrowed from a naval heavy cruiser like the Gneisenau-class warships, but modified to carry only two guns instead of the usual three. Each of the guns would have had a bore 280mm (11 inches) in diameter and could throw a shell (which could weigh as much as 700 pounds) as far as 25 miles. In addition, the Ratte was to carry at least one 128 mm anti-tank gun or possibly two 15 mm Mauser MG 151/15 autocannons. As the project was never finished, the location of these weapons on the vehicle are not clear, but researchers have speculated that they might be mounted forward and below the main turret or on a smaller turret or turrets at the rear. To guard against aircraft attacks, eight 20 mm Flak 38 anti-aircraft guns were also envisioned to be mounted on the machine. Unlike smaller tanks, the Landkreuzer was large enough to have internal self-contained lavatories and various storage spaces. There were also plans for it to carry two BMW R12 motorcycles which might have been used for scouting purposes. To spread out its tremendous weight, the Ratte would have needed six tracks, three on each side, rather than the usual two found on tanks. Even so, the monster tank's passage would have cracked the pavement and it could never have travelled over most bridges. However, with six feet of ground clearance and the use of a snorkel, the Ratte would have been able to ford most rivers with little difficulty. According to Panzer Leader, Heinz Guderian, the Ratte was Hitler's gigantic fantasy. Finding engines powerful enough to move the Landkreuzer was another challenge. Krupp, the company designing the Ratte for Hitler, proposed using two MAN V12Z32/44 24-cylinder diesel engines like those used on German submarines to give the machine 17,000 horsepower. According to calculations, this would have given the Ratte a top speed of 28 miles per hour. An alternative engine configuration that was proposed was to have eight Daimler-Benz MB501 20-cylinder marine diesel engines - identical to that used on the German fast torpedo boats - connected together to produce 16,000 horsepower giving the Ratte a slightly slower top speed. If a Ratte had ever made it to the battlefield, there was no ground-based weapon that the Allies had that could ever have hoped to compete with it. The heaviest-armored weapon the Americans contemplated employing in World War II was the T-28, a tank destroyer which weighed 95 tons. The T-28's 105mm gun would have been totally inadequate to deal with the Ratte, however. Of course, the problem for the Germans would have been to actually get the Ratte to the battlefield. With no road able to accommodate the super tank, it would have been limited to the open country. While its appearance in the combat zone, a rolling fortress the size of a small office building, and its seeming indifference to most anti-tank weapons might have struck fear into the enemy's hearts, it is really difficult to imagine it being an effective use of the resources needed to build and operate it. It would have been almost too big to engage most other tanks as its main guns would be unable to depress to the level needed to target them once they got too close. 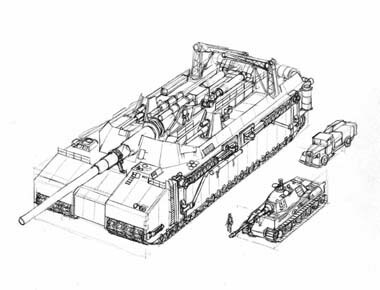 Most likely the Landkreuzer would have needed to travel with a retinue of other smaller-armored vehicles, much like an battleship is escorted by destroyers. A computer simulation of a Ratte built as a modification for the game Battlefield 1942. With its massive size the Ratte would be difficult to hide from enemy aircraft. If it had been possible to build the Landkreuzer and use it in the first World War before airplanes were able to carry heavy bomb loads, it might have been undefeatable. In the years between the first and second World Wars, however, aircraft technology developed enough to make the Ratte obsolete before it was even built. Despite the Ratte's anti-aircraft guns it would have been difficult to protect the machine against an onslaught of dive-bombers equipped with 500-pound bombs. A single bomb of this size would have been able to penetrate even the Ratte's armor and put it out of action. Hitler had planned an even bigger version of the Ratte, the Landkreuzer P 1500 Monster. This device would have carried an 800mm (31� inches) Schwerer Gustav artillery piece that could fire 7-ton projectiles. 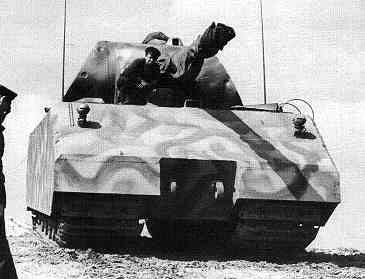 Because the massive gun would not be mounted on a turret, however, the Monster would have been considered self-propelled, armored artillery rather than a tank. In late 1944, Albert Speer, Hitler's Minister for Armaments, recognizing the impracticality of both of these projects in a Germany running out of resources, cancelled them both before any test versions were complete. Legend has it that the Ratte prototype turret was recycled as a coastal gun emplacement in the Netherlands, but recent research suggests the weapon in question was actually a turret designed for a navy cruiser. In fact, it is unlikely that even the smaller Maus would have actually been useful if it had made it onto the battlefield. It was supposed to have a top speed of 12 miles per hour, but no engine could be found that would power it faster than 8 miles per hour under ideal conditions. Some experts even question the effectiveness of the Tiger II tank. While it had superior armor and a powerful main gun, its complexity and size made it difficult to build, unreliable and fuel thirsty. In fact, of the 45 tigers lost by the 503rd SS Heavy Tank Battalion operating on the Russian front from January to April of 1945, almost all of them were not destroyed by enemy action, but by their own crews after they had broken down or run out of fuel. Perhaps the British had the right idea when they cancelled the Flying Elephant back in 1916. Being faster and more mobile can make up for a lot of armor and firepower. Hitler's super tank was, as Guderian noted, just a gigantic fantasy. Copyright Lee Krystek 2010. All Rights Reserved.